Popularly known as the 'Pearl of the Andaman', Phuket is one of the famous beach destinations of Thailand. It invites a huge number of tourists to its shores and assures them a truly memorable stay. Comprised of palm fringed silky beaches, various attraction points and several other delights, Phuket is a treat for those who want to enjoy adventurous activities and thrilling nightlife. The island features several attractions that one can enjoy during his visit to Phuket. Choose a speed boat to travel around various small Islands like James Bond Island and Phi Phi Island. All of these beaches have different appeal and allow the tourists enjoying fun-filled beach parties. 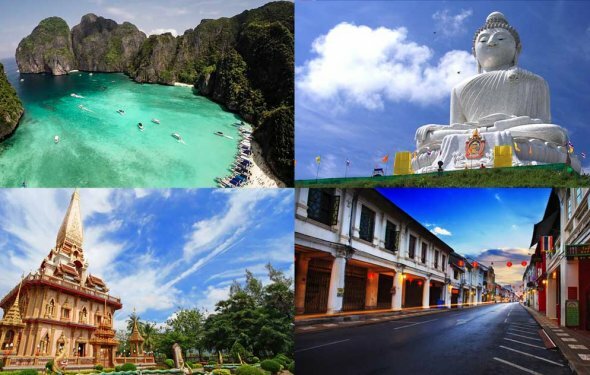 We have compiled a list of the sightseeing places that you can see while your visit to Phuket. We have compiled a list of the sightseeing places that you can see while your visit to Phuket for more information click here. Phang Nga Bay is an extraordinary place to visit in Phuket. Its limestone cliffs are positioned amidst the emerald green waters and spectacular views around. One of the popular landmarks of the Phang Nga Bay is the James Bond Island, which was shown in the movie of same name. A relaxed day trip while cruising through the spectacular limestone islands and seldom stoppages at the calm beaches are rewarding for its visitors. Different from the typical Buddhist temples o the world, Wat Chalong is an architectural wonder that mesmerizes the visitors with its utter charm. The highly metaphorical structure of the temple features one of the most significant Buddhist statues. It is the largest and most significant temple in Phuket Island. The key feature of the temple is the Grand Pagoda that encloses a bone sliver of Lord Buddha. The walls of the pagoda are amazingly decorated with murals portraying Buddha’s life. Spend some time in this temple to experience something unusual. Positioned on the top of Nakkerd Mountain between Chalong Bay and Kata Beach, Big Buddha is one of the most significant landmarks of the island. It is truly a massive site which enjoys the panoramic views of the island. Close to this idol, you can feel an unusual peace and the only sound that can be heard is the jingles of small bells and the yellow Buddhist flags. Fantasea is a huge 140-acre complex featuring an ultimate Thai culture theme park. It allows the visitors to enjoy various activities along with complete entertainment. The main highlight of this park is the Las Vegas style theatrical show that is a beautiful blend of Thai traditional myths & humor, fantasy and a slack plot. It is one of the must visit attractions in Phuket that should not be missed. This interesting show deserves to be in the list of ‘Must Do Things in Phuket’. Phi Phi Island deserves top place among the famous islands of Thailand. It is a prime reason to arrive in Phuket. The immaculate beauty of the island creates alluring experience for the visitors. By approaching through the boat, the islands seem to rise like a fortress from the sea. It is really a lovely sight.